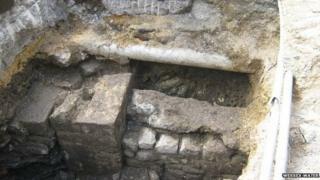 Engineers carrying out sewer repairs in Bath have uncovered part of the Roman city walls. The discovery in Burton Street was made when a large stone block was uncovered nearly 3ft (90cm) below the pavement, a Wessex Water spokesman said. Further investigations revealed the block was part of the stone wall which dates back to the 4th Century. "This is a very significant discovery," said Natalie Doran, an environmental scientist with Wessex Water. "Bath is an archaeologically rich city, however, discoveries of this significance on our schemes is very unusual. "From archaeological consultation with Bath and North East Somerset Council we knew that there were surviving sections of the city wall nearby, but this discovery was still a surprise both for us and the archaeologists." The wall, which was built as a defensive structure, is made up of five blocks of Bath stone and possibly forms part of the buttress of the original city wall. While no dating evidence has been recovered, tool marks on the stone suggest it was originally worked in Roman times. Once all the surveys have been completed the wall will be preserved in situ and the trench will be back filled and work relocated.